It’s no secret around this site that I love the bulk bins. My cooking revolves around having a collection of jars and containers full of beans and grains. 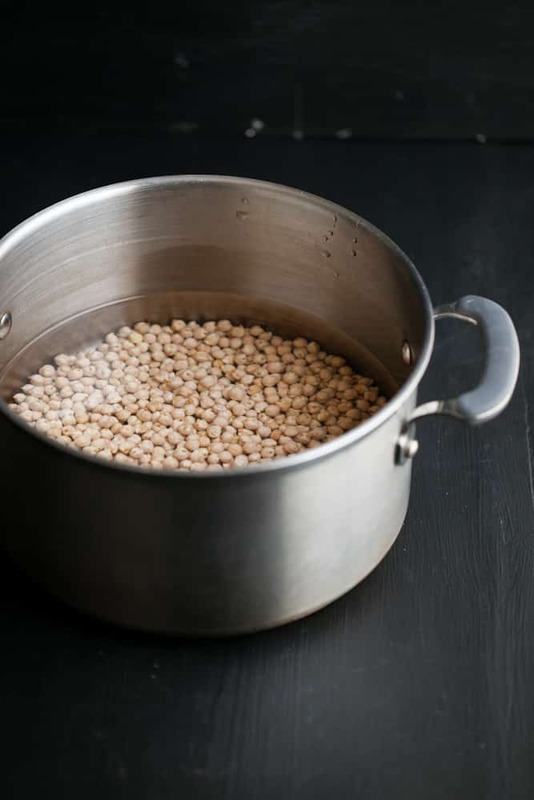 While there are plenty of instructions about cooking with dried beans (everything from crockpot cooking to pressure cooking them), I prefer the slow (and gadget-free) method: soaking and boiling in a large pot. Step one: Pick through the beans and pull out any odd ball beans. These often come in a darker color, more shriveled texture, or sometimes in the disguise of a split pea. Give a good rinse. Step three: Drain and rinse one more time, then cover with water and bring to a boil. Cook until tender. I’ll start tasting after 30 minutes and go until the beans are soft and the consistency I want. Step five: Pull out and thaw what you need! 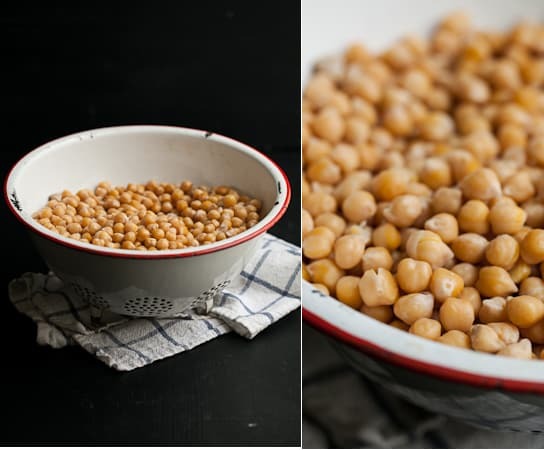 If you store in liquid, it’s best to pull the chickpeas out to let thaw but if storing without liquid, I’ll often chisel out what I need and toss the chickpeas still frozen into the dish I’m making. 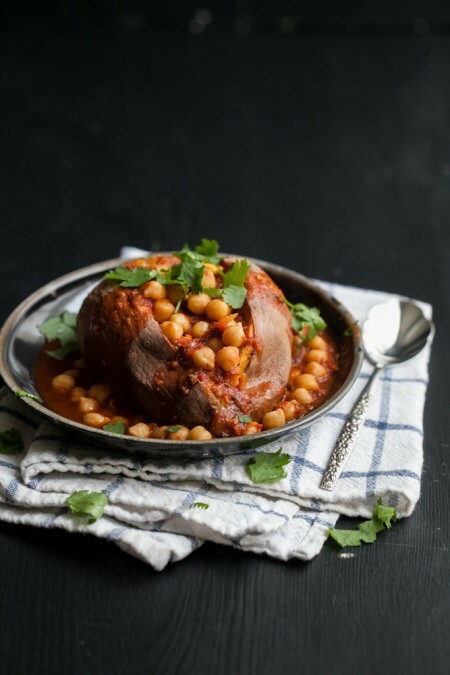 So now that you have a huge stock pile of chickpeas in your freezer, pop over to Good Life Eats to get the recipe for this wonderful chickpea smothered potato. It’s the perfect warming meal for a cold winter’s day! 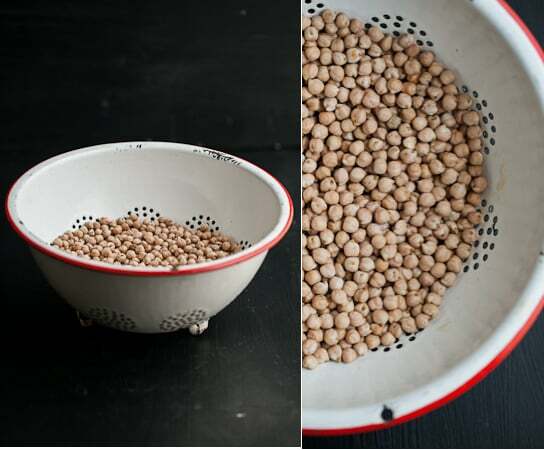 Such a useful post – I am relatively new to cooking with dried beans and pulses and I always worry that I’m somehow going to mess it all up completely! I am converting to using dried beans. I think I would save myself a lot of money since every trip to the store I am buying more beans of all varieties. Awesome! I’m always guilty of buying way too many beans but the great thing- they store really well! I agree! I always use to think dried beans were such a hassle but once I started doing it, I couldn’t believe I’d gone so long! But one time I bought them in a can and I couldn’t eat them, because they were disgusting. I’d like to make the transition to making my own beans instead of using cans. I love your post today on freezing in portion-size mason jars! Do you reduce the heat after bringing to a boil or do you cook at a boil? I usually just leave them at a boil, skimming off the foam that forms on top! Dont yell, but in a hurry, can you microwave the beans ? I bet you could- never tried!